I have to admit, I’m basing this claim off one trip to BC, to Victoria and Vancouver specifically, but based on reviews from others, this general sense of amazing extends to the whole country. If you’re on the fence about visiting BC, let me sway you. You should really go. Rock and AirBnB, and spend your hard earned cash on food instead of lodging. 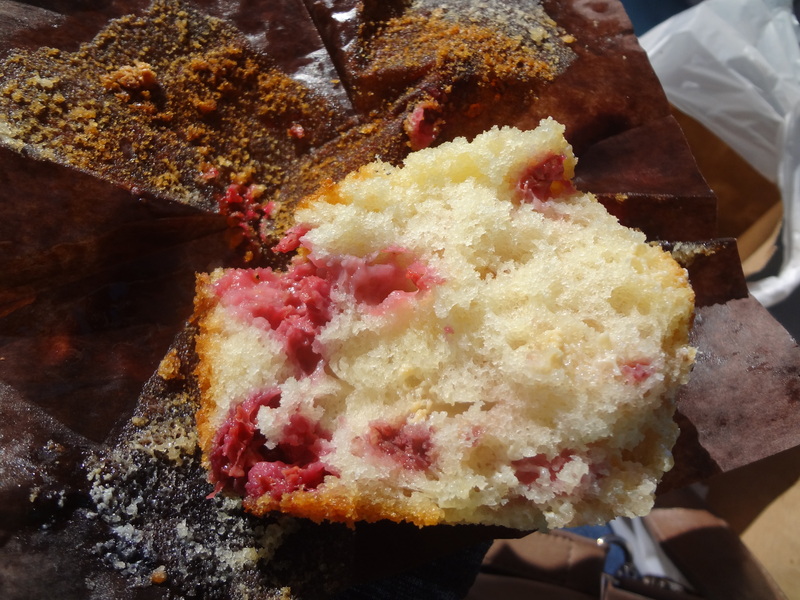 Here are the highlights from our very delicious vacation. We started our trip in Victoria. 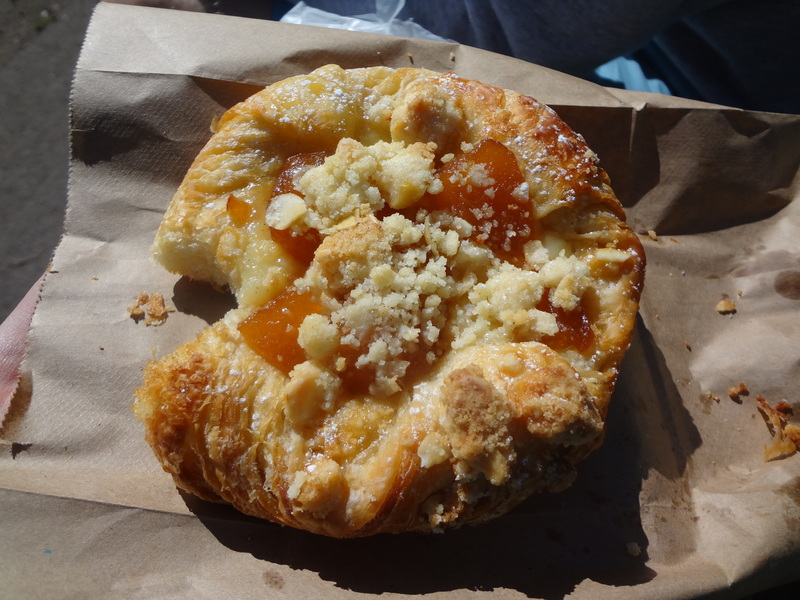 Incredible views, amazing weather, and this shockingly good pastry shop. 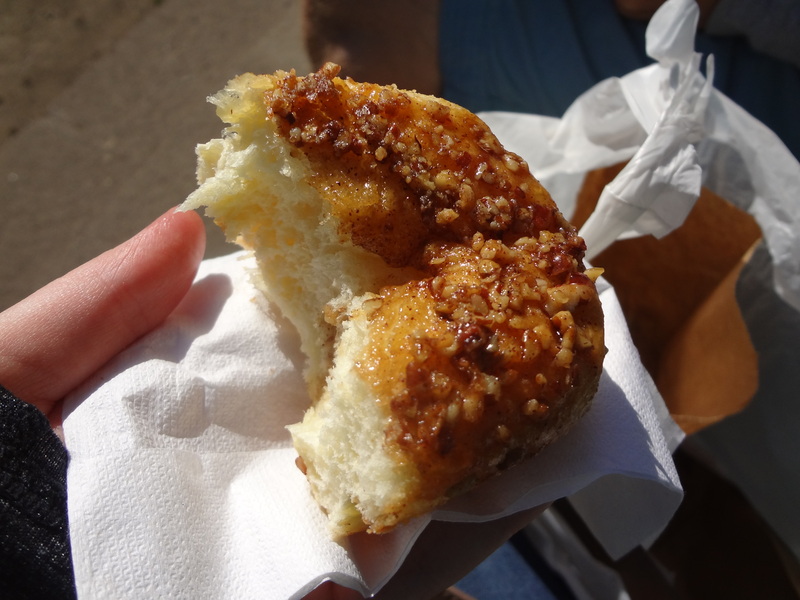 Considering I had a mission to try as many different eateries as possible on this trip, the fact that I demanded breakfast from the same place not once, not twice, but all three mornings of our stay in Victoria should tell you just how good this bakery is. While we ate here three days in a row, I only have photographic evidence of our last day, because I ate the other pastries too quickly to remember to take photos. Sorry. 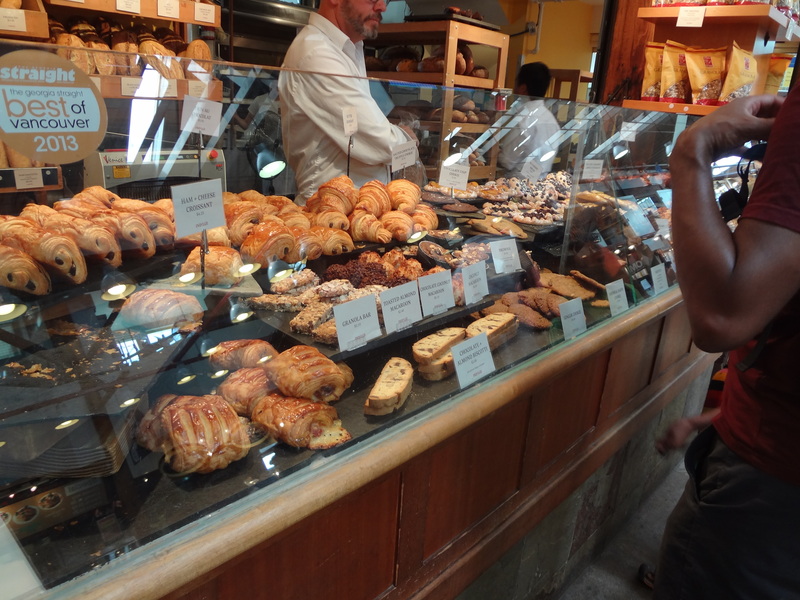 They were really good pastries. If you stop by, and they have the ham and pesto croissant, definitely get that. We ate it twice, and it isn’t pictured here, but it’s like pizza croissant for breakfast. Phenomenal. Pictured above, we have the apple danish (also sampled the blueberry and blackberry apricot varieties) and the white chocolate raspberry muffin (also sampled the blue berry and strawberry cream cheese). And here, we have the lovely caramel roll, fresh out of the oven as I walked into the store. Dreamy. 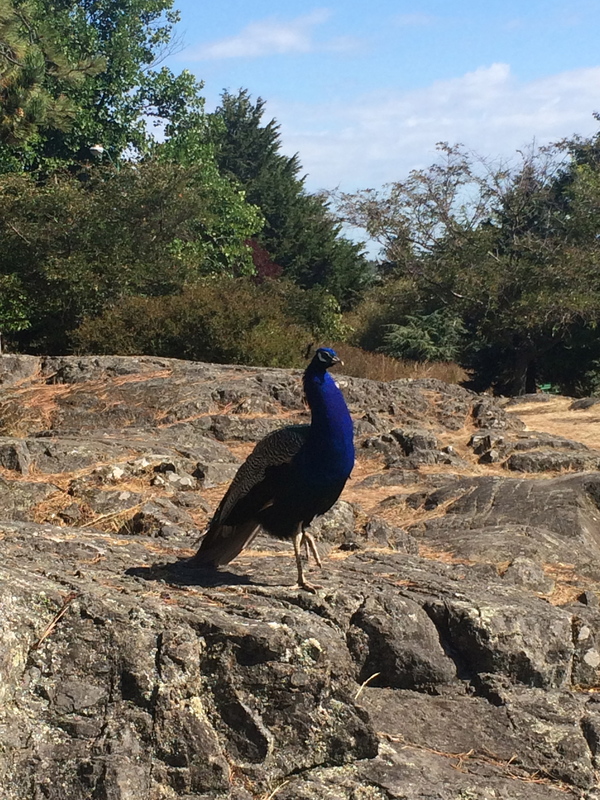 Did I mention we ate this particular breakfast in Beacon Hill Park, where rogue peacocks just saunter around? It may look a bit touristy, but this scenic restaurant located in the historic Steamship Terminal has fantastic desserts. We didn’t actually try the food, but wine and desserts filled our celebratory “I’m on vacation” needs perfectly. 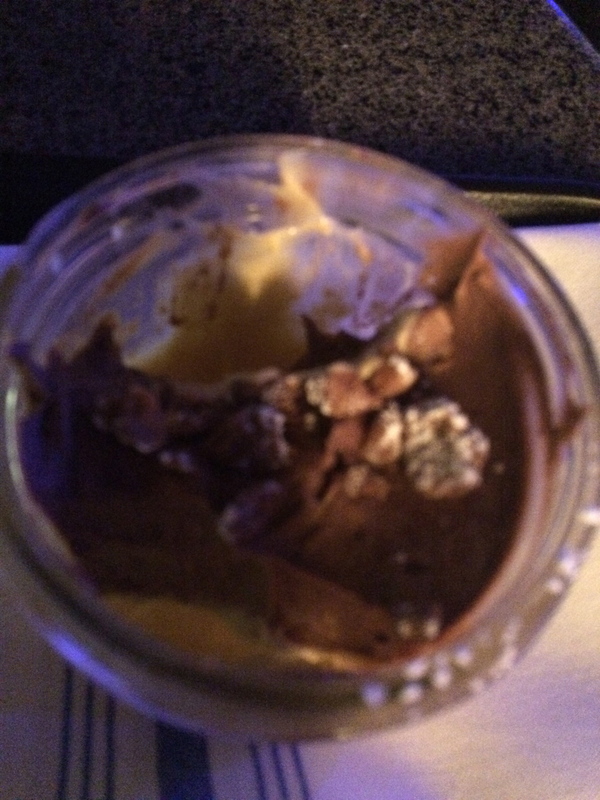 This is a very unappealing photo of what was the best pudding/mousse dessert of my life. I was too busy eating to take a proper photo I guess. Butterscotch pudding hid under a layer of the thickets chocolate mousse I’ve ever seen, like if ganache and mousse had a baby, and then was topped with crunchy toffee bits. Yummzzzz. Did I mention that BC is all about sustainable, local foods? So not only do they satisfy my tastebuds, but they live up to my outlook on food production as well. Case in point: The happiest little non-Dr.-Seuss-Dr.-Seuss-esque named restaurant in Victoria – Red Fish Blue Fish. It’s housing in a former shipping container on the docks of downtown Victoria. Stunning ocean views, all locally sourced and sustainable fish, and some good cooking make this a cannot miss on any trip to Victoria. 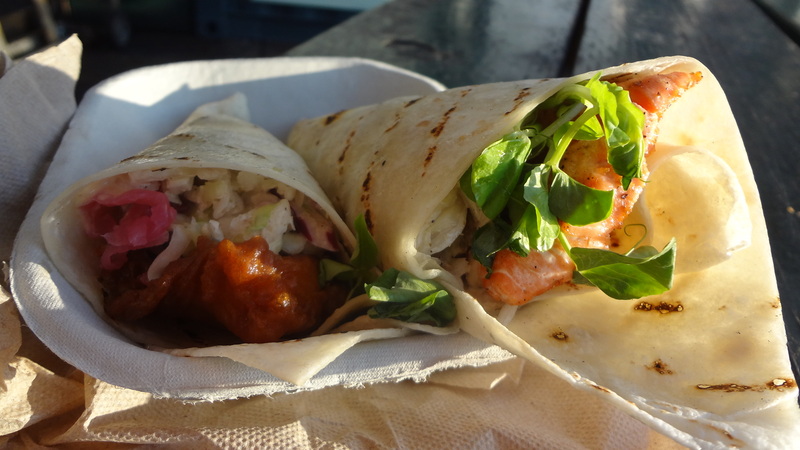 I tried the grilled salmon and tempura cod “tacones” (pronounced tak-cones, not at all spanishy) and they were both delish. The tempura cod edged the salmon out slightly. Probably because, you know, fried things. But either way, I would not turn down any sort of tacone after eating these. Ever. At this point, I want to throw in a special shout out to my other love. Books. Food + books = very happy Kathleen. 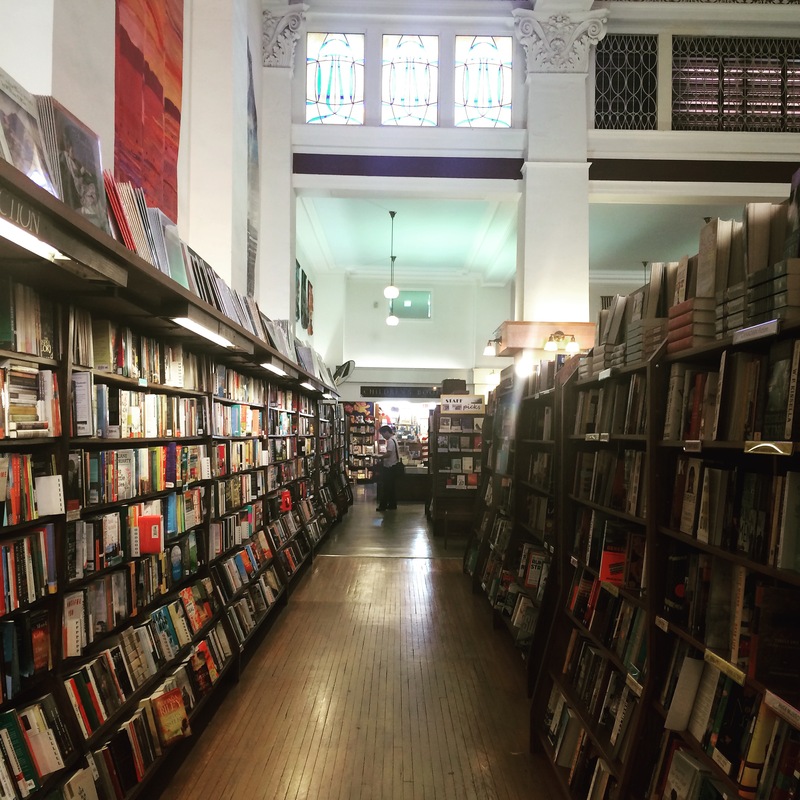 So when I stumbled across the cathedral of a bookstore that is Munro’s Books in Victoria, I knew I was in heaven. Just look at this. That’s just one aisle. If you love food and books as much as I do, then stop reading now, and go book a trip to Victoria. Just do it now. And we’re off to Vancouver! Remember that time I went to San Francisco and rode a hop-on-hop-off bus and accidentally found the best pizza in the world? Believe it or not, something similar happened in Vancouver. Except with Vietnamese food. Vancouver has a very diverse population with a large percentage identifying as Asian. That means loads of fantastic, authentic Asian cuisine and fusion restaurants. So we’re cruising around on another hop-on-hop-off adventure, when we get off to visit English Bay Beach so I can be all vacationy at the ocean. By this point, we’re pretty hungry, and I’ve already discovered that Denman Street in Vancouver is a huge Eat Street, so we start wandering down Denman, and immediately find Baoguette. Someone was sitting at a sidewalk table, eating an amazing-looking plate of noodles, so after some further exploring, we circled back to eat. 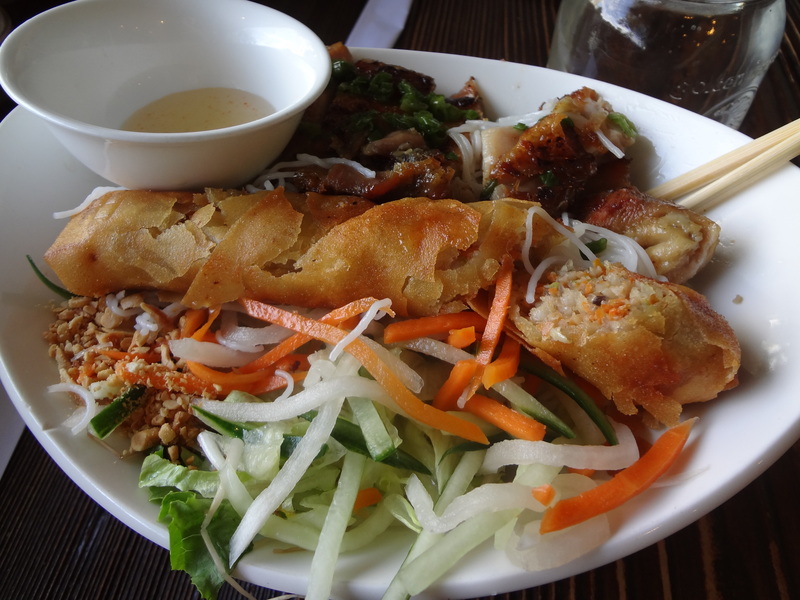 I haven’t had Vietnamese food before, and I don’t know why I waited so long. This was SO GOOD. Probably my favorite meal of the trip. No joke. We ordered the #46 (heaven help me, I cannot remember what the name of the dish was, but that’s my new lucky number) and were presented with some sort of magically grilled chicken, a spring roll, and a big pile of noodles with sauce to pour over the top. And we got to eat it all with chopsticks. I swear, working for your food makes it taste even better. That chicken though. For real, I don’t know what they put on it, or how they cooked it, or whether they let it marinate or what, but it was amazing. That meal alone was enough to convince me Vancouver is worth a second trip. This is a hidden gem, everyone should try it! 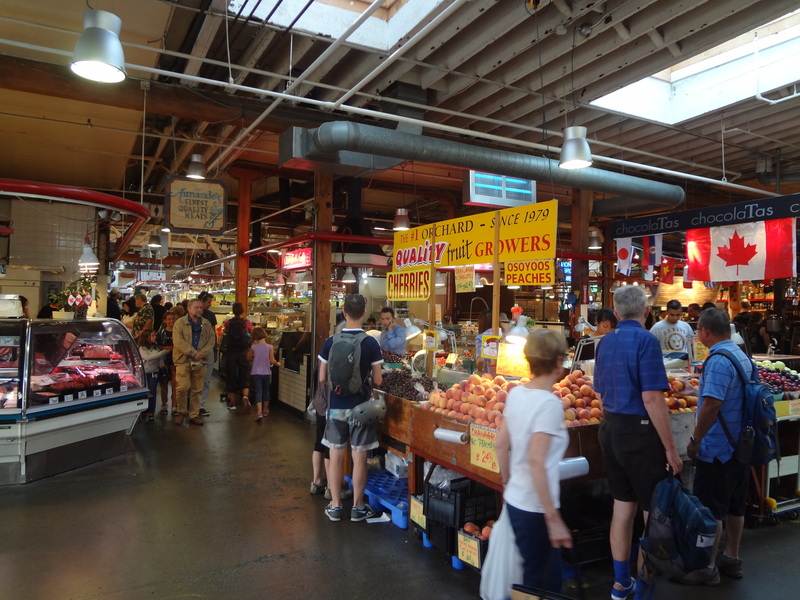 Granville Island is a must-stop for anyone who loves food. It’s packed with restaurants (we didn’t get a chance to try these) and a huge public market featuring local meats, cheeses, breads, soups, a food court, tea, desserts, and anything else you can think of. 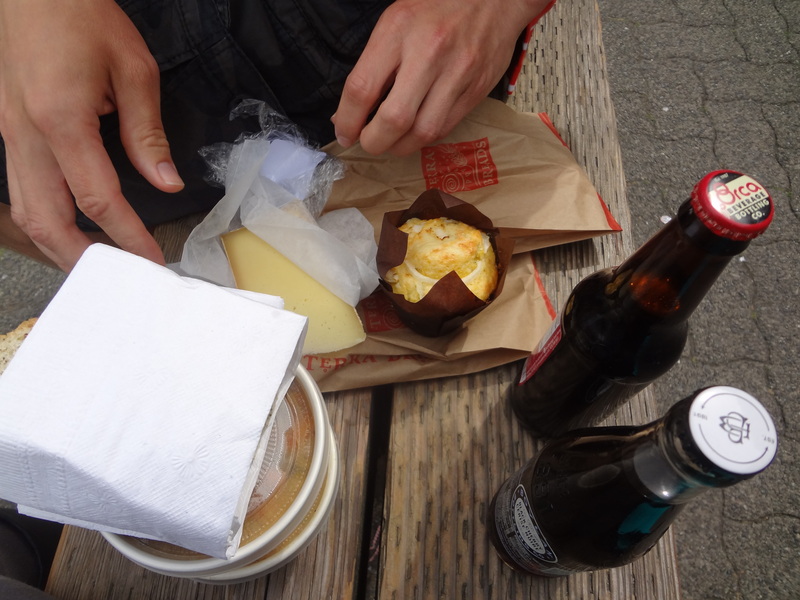 It was incredibly fun to shop the stalls and pick up food for a picnic. We had some soup with fresh red snapper and smoked salmon, bread, cheese, more bread, corn bread, pop, and desserts (not pictured) and were happily stuffed for the rest of the afternoon. Be warned, we stopped by on a Monday afternoon, assuming it would be slow, and found it packed, so if you go on a weekend, be prepared for madness. Get ready for more blurry pictures of my dessert! Fun fact: In Vancouver, gelato is totally a thing. Ice cream as we know it? Not so much. I have no beef with gelato, but I had been craving ice cream for my entire trip, so you can imagine my delight when, on our last day, we stumbled across the most adorable local ice cream shop. And then ate ice cream for dinner. Because what else are you supposed to do as an adult on your last day of vacation? 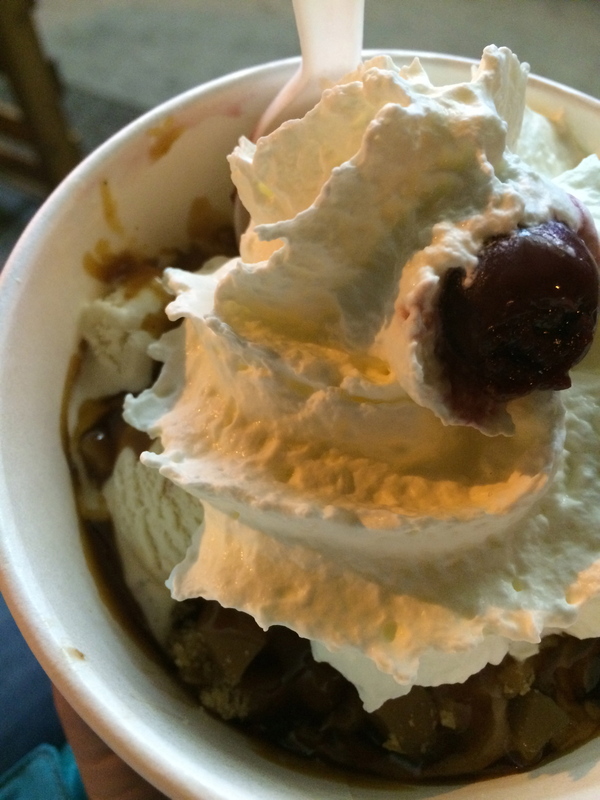 I had a sundae with peanut butter ice cream, chocolate ice cream, caramel, toffee bits, whipped cream, and a cherry. And it was an actual cherry soaked in delicious. Tart and juicy. The peanut butter ice cream was incredible, I have never had peanut butter ice cream so good. It makes me want to stop everything and open an ice cream shop. No joke. On our way to Vancouver from Victoria, we stopped in Nanaimo over night. Why? Because (small world!) Kyle’s cousin from Norway happened to be on Vancouver Island at exactly the same time we were. That’s too good a coincidence to pass up! You know what else is crazy? The food in Nanaimo. No joke, I don’t have a picture because I was too busy stuffing my face, but I had my first Greek food ever at Asteras and it was the only meal on the trip that rivaled Baoguette. I had the lamb and it was so tender you could look at it funny and it would fall off the bone. I would have never guessed a meal like that would come from a small seaside town, but I should have known better. 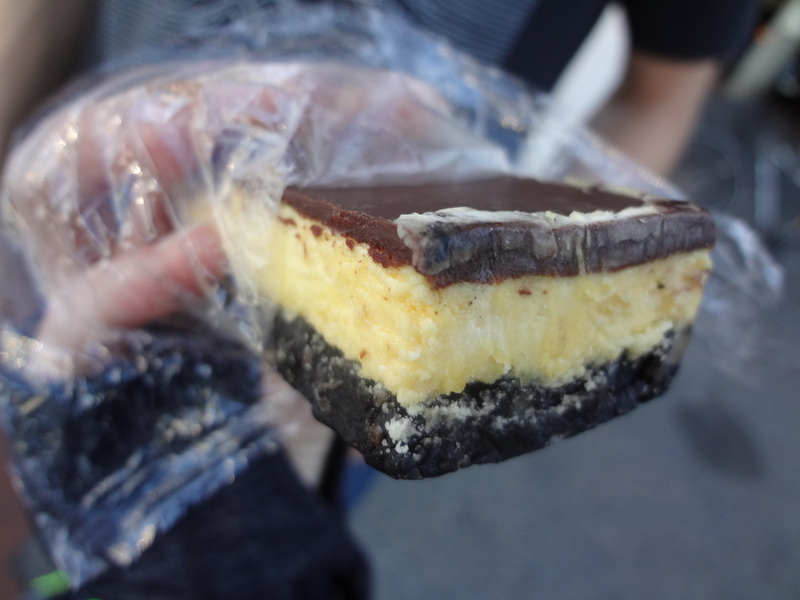 And of course, we had to sample an authentic Nanaimo bar while in Nanaimo. Apparently they were invented there. I’m not kidding, it says so on the Nanaimo tourism website. This bar was amazing; chocolatey, creamy, crunchy, everything you want a good dessert to be. There will definitely be some Nanaimo bar experimentation happening in our house! This entry was posted in travel eating, Vancouver, Victoria and tagged best restaurants in Vancouver, best restaurants in Victoria, Eating in British Columbia, Granville island, Greek food, Ice Cream, Lamb, Nanaimo bar, Vancouver, Vancouver Food, Victoria, Victoria food, vientamese food by theculinarycapers. Bookmark the permalink.